Since their move from New Jersey in the summer of 2012, the current Brooklyn Nets franchise has had a grand total of two (2) NBA All-Stars. The most recent is the ageless, egoless, nearly-anonymous Joe Johnson, fresh off eviscerating unsuspecting foes with his iso-heavy wizardry and shooting among the best percentages of his career in both the regular season and playoffs with the Utah Jazz. The other is a twin with a noted fondness for everything Disney and cats. He toiled for several years with a team that squeaked into the playoffs in 2015 before descending into what is essentially indentured servitude to the Boston Celtics, a lottery-bound squad without recourse that has racked up a grand total of 41 wins over the past two seasons. 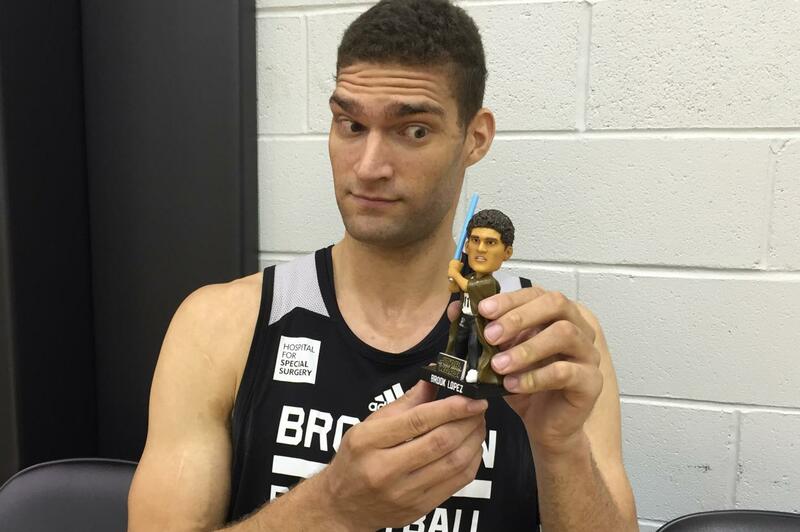 Following a pre-draft trade with the Los Angeles Lakers, perhaps, finally, Brook Lopez will be able to find peace. So went a text message I received on June 20th, one which was the first reaction of many that I saw in response to a trade in which the Brooklyn Nets sent Brook Lopez and the 27th overall pick in Thursday night’s draft, which ended up being Utah forward Kyle Kuzma, to the Los Angeles Lakers for D’Angelo Russell and NBA champion Timofey Mozgov’s contract. All things considered, nobody was really weeping for Lopez before this: a nine-year NBA veteran and, unlike his twin brother Robin, a lottery pick, Brook has carved out a place of his own as a 20-and-7 center. He had been the rock of a Nets franchise, the lone remaining member from their time in New Jersey and a faithful soldier with the patience of every NBA fan in the tri-state area combined. A 2664% increase in three-pointers attempted with a 142% increase in success rate is, well, rather uncommon in today’s NBA. Somebody like that, especially a 29-year-old seven-footer who could’ve easily relied on his incumbent talents to continue being productive, even as the game shifts around him. All of which makes his move to the Los Angeles Lakers, arguably the league’s most star-studded, and center-laden, franchise historically, so intriguing. Lopez has known no other home than the Nets, a dysfunctional organization whose peers in that realm include the Knicks and Bulls, yet, as a Hollywood native and Stanford product, he likely understands what he is walking into. Lopez is among the most consistent players in the NBA – no, really, he is, save one injury-stricken and lockout-shortened season in 2011-’12 –, and his willingness to embrace a treacherous situation is paralleled only by executives seizing forlorn franchises and established star players walking into unfathomable amounts of money. The current Lakers roster is something to behold, truly. Aside from Corey Brewer and Luol Deng, and with the opting-out of Nick Young from his contract, the entire roster comprises players under the age of 30. Lopez is about to be the talisman yet again, a role he knows all too well, but with the Lakers, there is a much brighter light at the end of the tunnel. Paul George is almost certainly going to be a Laker, sooner or later. He’s said as much. With a core of Lopez, Brandon Ingram, Jordan Clarkson and noted TwH favorite Julius Randle, Lopez is walking into a position of real influence, one where he can be a beacon of strength and, if need be, of resistance. Years of experience in the NBA have gifted him with that. On his new team, Brook is going to fly under the radar. Next to Lonzo (and LaVar) Ball, next to the aforementioned Clarksons and Randles of the world, Lopez will be but a byproduct of a Luke Walton-invented (or -perfected) system, someone to create shots for others and make a miracle out of a mess in some situations. If it’s anybody – and for casual NBA fans, searching for something interesting in a massive pile of afterthought – it’s Brook Lopez. A seven-time All-Star, lest anyone forget. Pouring one out in the footnotes for the Brook-Lin moniker, something on which the Nets did not capitalize nearly enough in Lopez’s lone season with Jeremy Lin. Did you realize he only just turned 29, and isn’t yet 30? Greetings to Dwyane Wade’s $23.8 million player option for next season, into which he recently opted.